After a hat-trick of successful October Himalayan Odysseys   , we had to go for the Golden Sombrero. But on the other hand, Rome had just taught us that the life is all about collecting illegible stamps on a passport. Thankfully, there was a way (well, a few) to combine the two. We chose the Bhutan way as its new Lonely Planet edition was due this year and I had some Amazon gift cards threatening to expire. 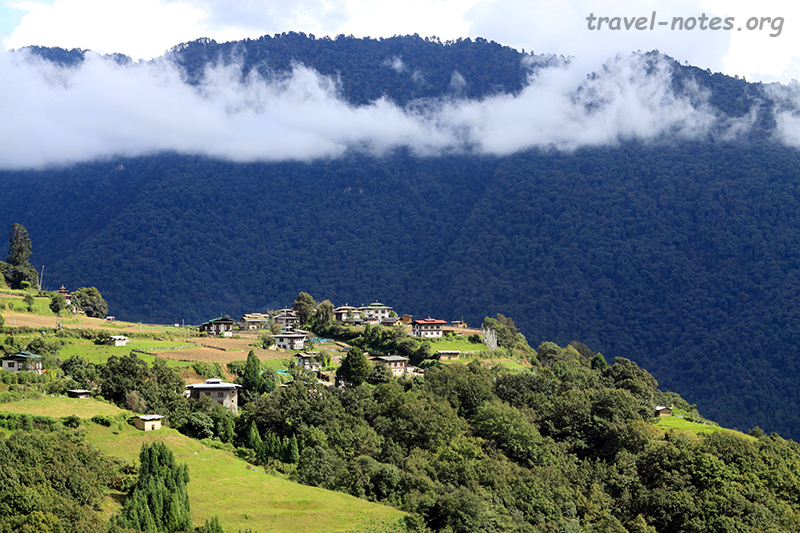 Also, Bhutan seemed to have an air of secrecy to it and it was not all hype and imagination. Surrounded by the third of humanity, it has a population density of Vanuatu. World saw me before Bhutan saw its first tourists. Y2K bug was history before its citizens saw their first Television Soap. And its capital still hasn’t seen an aeroplane land or a traffic signal for that matter. However, none of these was its biggest selling point to us, Indians. That would be that it is the only country where it is better to travel with an Indian passport than western; the only country where Indians can walk in without a visa while others shell over $250 per person per day to peep in; the only country to peg its currency to the Rupee. Since our capital had an airport and theirs didn’t, day-one saw us go through a lung stopping landing in Delhi and a heart stopping one in Paro – the former due to its infamous smog and the latter due to its geography. Paro has the hardest airport on the planet to land a plane and being in one as it dodges and weaves around the hills is indeed a hair raising experience. A pleasant hour and a half drive brought us to Thimphu. A good night’s sleep helped us tide over the 30 min jet-lag and we started our day bright and early at the National Memorial Chorten, built in 1974 in the memory of the third king and housing an elaborately carved three-tier temple on the inside. We then hopped over to gape at the brand spanking new gigantic Buddha at the Buddha Point and then hopped further uphill to see the quixotic Takin at the Preserve. While rolling downhill back to the city centre, we stopped briefly at the Nunnery housing a temple dedicated to Thangtong Gyalpo (credited to have built many an iron bridges in the region) and the 12th century Changangkha Lhakhang housing an impressive eleven headed statue of Avalokiteshwara. After a sumptuous lunch we headed to the Tashichhoe Dzong. When Zhabdrung Ngawang Namgyal arrived here from Tibet, he found the place devoid of any strong political structure. He decided to build a series of Dzongs (loosely translated as “fort”) across the country, around the region’s most famous religious site and housed the bureaucracy inside it. He also had the foresight to separate the religious from the secular and installed independent heads for each, thereby conjuring up a form of government in a generation which the West took a millennia to invent. 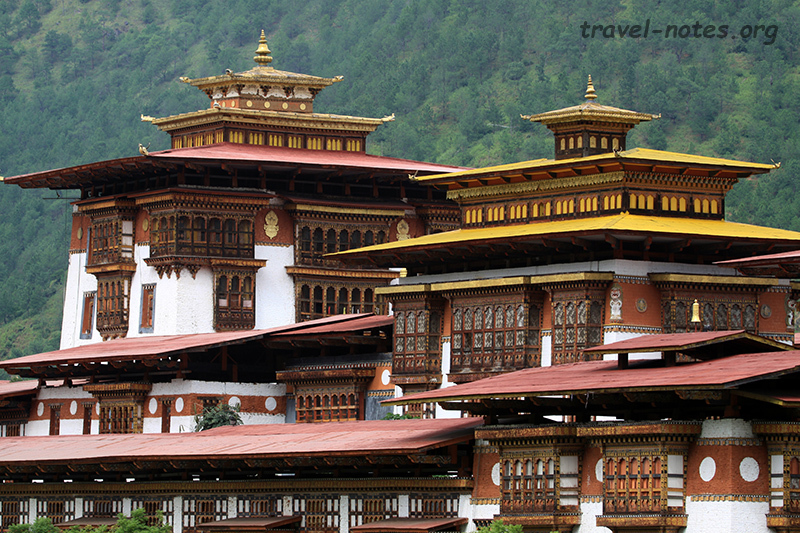 Tashichhoe, the said dzong of Thimphu, sits emphatically in the middle of the valley. The site temple, typically the only building a visitor is allowed access to in a dzong, contains a gigantic, yet beautiful statue of Sakhyamuni Buddha. The next day was spent on a leisurely drive to Wangdi. After a brief stopover at the Simtokha Dzong (first that Zhabdrung built), we drove to the 3,100 m high Dochula Pass where the Midas touch of Bhutanese architectural skill was in full display. Bhutan excels where every other country struggles – to make a modern monument look like it has always belonged there since the dawn of time. In Dochula, it is an array of 108 Chortens that seems to float above a layer of fog, built here in 2005 as an atonement for having played a part in flushing out the Assamese militants from Southern Bhutan. 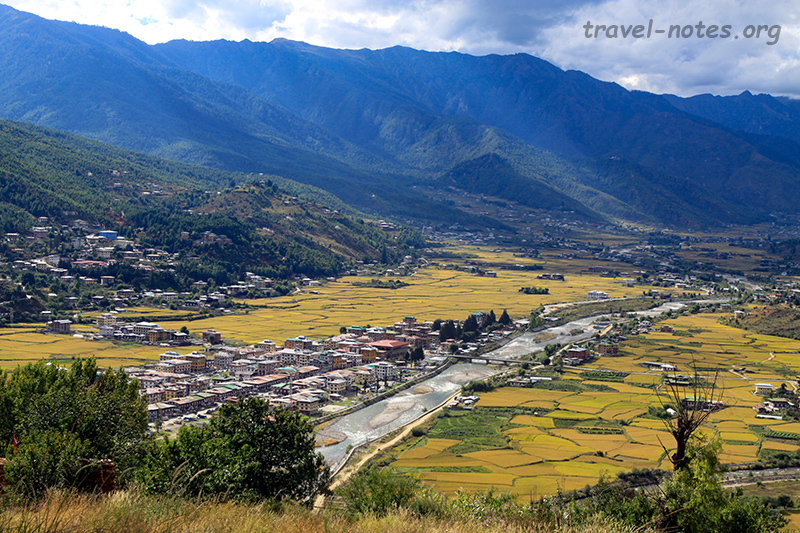 An hour past the pass is the village of Lobesa with a “only in Bhutan” quixotic temple Chime Lhakhang sitting pretty in the middle of picture perfect paddy fields. 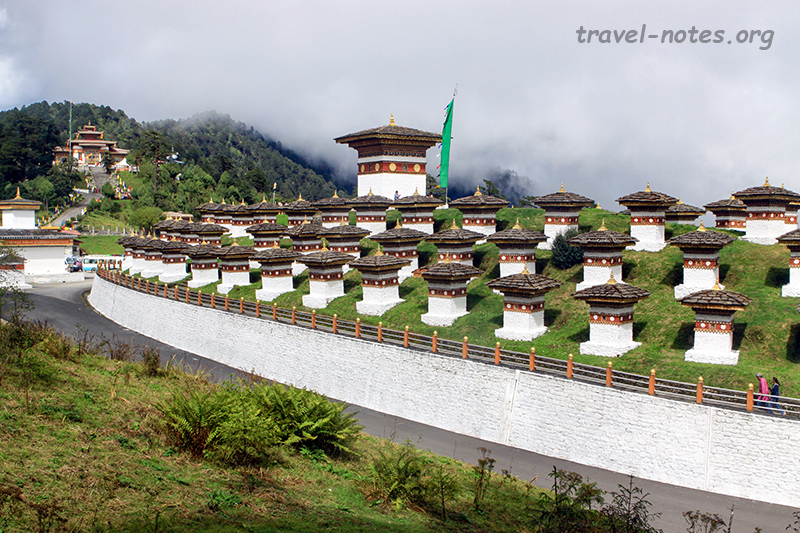 Built in 1499, the temple is dedicated to Drukpa Kunley, popularly known as the “Divine Madman”. He has earned the moniker by achieving the impossible task of mixing Buddhism, of all religions, and unbridled promiscuity. The collective cultural memory of his exploits are quite vividly captured in the most explicit depiction of a phallus anywhere in the religion-dom. Rubbing of our eyes in utter disbelief continued as we headed onto Punakha, thanks to the most beautiful building in all of Himalayas – the Punakha Dzong. Located at the confluence of Pho Chhu and Mo Chhu, surrounded by lush green hills, the gleaming white building with bright red roof has sure made several hearts skip many a beats. If you can drag yourself to the inside, the site temple can awe you even more with its gigantic statues of Rinpoche, Zhabdrung and Buddha. 20 min trail behind the Dzong brought us to the longest suspension bridge in the country, the 160m long pure wobbliness across the Mo Chhu. Our drive eastwards continued the following morning. As we gained elevation from the Wangdgi valley, we lost the road to a series of potholes, then potholes to a series of boulders and the boulders to a knee deep quagmire of muddy slush all with a sheer drop of a few kilometers on the cliff side. We haven’t yet figured out how the driver managed to drive through this with nonchalant ease, all while nodding to Bollywood numbers which managed to deteriorate in quality twice as fast as the road. The scenery, thankfully, was going in the opposite direction – improving dramatically culminating in the country’s prettiest of valleys - Phobjika. Had we come here a month later, we would have caught a glimpse of the famed migration of the Black Necked Cranes. For now, we had to do with just the drop dead gorgeous views and the gleaming Gangteng Goemba, occupying the top of the only hill in the valley. The 450 year old Goemba is the largest Nyingma monastery in the country and had all the serenity befitting the setting. After jostling past the 3420 m high Pele-La, and a welcome break at the lovely riverside Chendebji Stupa, we got our first glimpse of the majestic Trongsa Dzong. Built on a hilltop, a local maxima in a deep valley, this longest of the dzongs is also its most dramatic. Since we had spent one too many hours at Phobjika, we had to drive past Trongsa, saving it to break the monotony of the return journey. Three more hours of jostling on top of rattling where exotic wildlife joined breathtaking scenery to keep us from complaining about the roads and Yo-Yo Honey Singh. And I swear we saw a Golden Langur. All this driving, thankfully, had a destination – the Bhumthang Valley, which is actually an umbrella term encompassing four independent valleys – Ura, Tang, Chokhor and Chhume. It is home to some of the most important religious sites in the country. We started off at the Jampey Lhakhang, built by the Tibetan king Songtsen Gampo in 659 AD making it the oldest temple in Bhutan. 20 mins up the valley past lumbering cows and frolicking magpies lie the Kurjey Temple Complex. It was here in 756 AD where Guru Rinpoche (Padmasambhava for people who can pronounce Sanskrit) first arrived in Bhutan, subdued a local deity and left his body impression on a rock. A temple (what else?) has enclosed this rock since 1652 and many temples have sprung up around it in the last century. Of these, the statue of the Guru in the middle Kurjey Temple is the most spell-binding. After checking out a few more temples, we headed to the Membartsho Lake, which is nothing more than a slow moving section of a fast moving stream. In the off chance that your Dzongkha is rusty, Membartsho means Burning Lake – named so because the 15th century treasure hunter Pema Lingpa is said to have searched its abyss using an oil lamp which miraculously worked throughout the search and retrieve operation (well…. pictures or it didn’t happen). 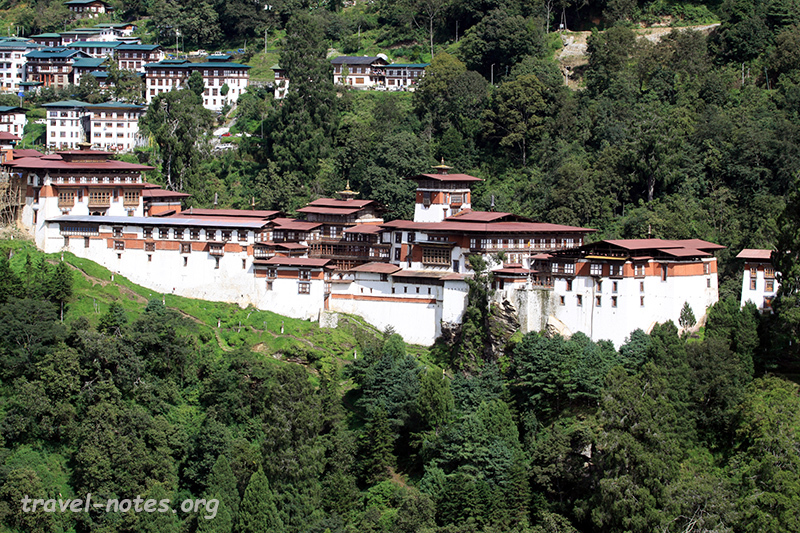 Oh yes, Bhumthang also has a dzong – Jakar Dzong. It is not the biggest or the longest, but still commands the best view of the valley and architecturally, immensely pleasing. This list of sights obviously isn’t nearly enough to cover a day. Rain ruined most of what was left and we salvaged the dry bits by walking the most scenic parts of the region. The following day we had to grit and face the return journey, now fully aware of that it is easier to find enlightenment than finding asphalt on this route. Thankfully, we had the Dzong at Trongsa to look forward to and the view from its ramparts alone was enough for us to declare the entire excursion worthwhile. It took us a day and a half to retrace our path all the way back to Paro. We had to detour a little in Thimphu to check out the Textile Museum and the National Library which conveniently closes on weekend when we were here last (Bhutanese bureaucracy have learnt well from their neighbours). Paro sights occupied us for the half a day that was left. Paro Dzong was imposing enough to wow us even at the fag end of a week of dzong hopping. The nearby National Museum showcased the nation’s best mask collection. The 15th century Dumtse Lhakhang amazed us with the finest murals in all of Bhutan and in the historic Kyichu Lhakhang we ran into the Queen Grand Mother herself. 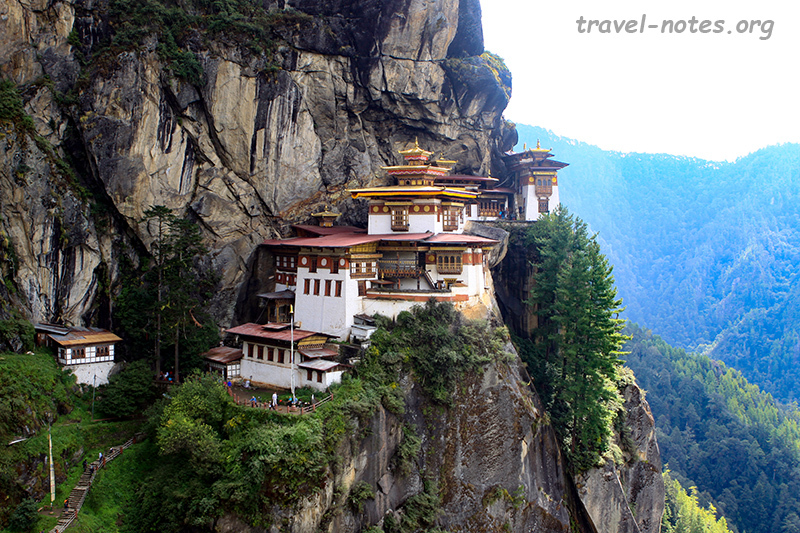 Tiger Nest Monastery is to Bhutan what Taj is to India or the Great Wall is to China. If there is only one thing you get to see in Bhutan, it better be this and not any of what we spent the last week seeing or you spent the last few minutes reading. But unlike the Taj or the Wall, it takes some effort to see the monastery. It clings for dear life to a small discontinuity in otherwise a sheer vertical wall almost three-fourths the way up. Apparently, it was here that the Guru Rinpoche flew to, after his sojourn in Eastern Bhutan. Since Bhumthang air strip was not yet constructed, he had to convince his consort to transform into a flying tigress and flew on her back. And if your consort is anything like mine and refuses to transform, then you have no option but to haul yourself up a steep trail. It is 4.5 km long and gains an elevation of about a kilometer. After huffing, puffing, cursing and questioning our life choices for about two and a half hours, we got to the view point offering the billion Ngultrum view (million ain’t much in rupees). The first sight of the monastery is as utterly unfathomable as the legend behind its existence. It was built in 1692, using the technology of 1692 but looked straight out of a 21st century Hollywood set. And it houses not one, but eight elaborately decorated temples and one of those houses such enormous statues that getting just one from the Paro Valley would have been an NP-Hard problem. Thanks to the experienced guide, we had started early making it here by little past 9 am and thereby getting to see the complex in complete solitude and to experience one of life’s small pleasures on the way down – bragging to the hikers who were on their way up. Since the monastery was such an important event in the itinerary, we had to budget an extra day for insurance. Post event, we had to find a way to spend it. We did a day trip to Haa, the valley adjacent to Paro. It had a couple of 7th century temples Kharpo and Nagpo Lhakhang (White and the Black Temple), a quaint picture perfect town centre and a crossing of the highest motorable pass in the country, the Chele La (3810 m). Although it did pale in comparison with the high of the previous day, it was a far better way to let that high sink in than in the cramped environs of the dreaded seats in front of the Exit Row. I had planned an elaborate conclusion detailing the hardship that Himalayan Explorers like us have to confront starting from the non-reclinable seats, insipid food and too long an overlay, but Google decided to Doodle on this guy today, of all the days. Somehow after reading that, torment of having to deal with flimsy on-air cutlery while being distracted by the views of the High Himalayas seemed a bit less of an ordeal. 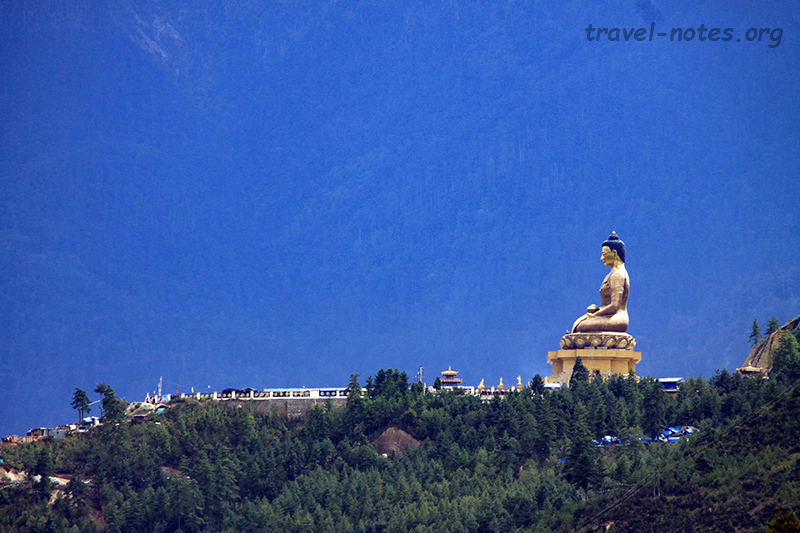 Click here for more photos from Thimphu and Paro. Click here for more photos from Western Bhutan. Click here for more photos from Central Bhutan.